A deeper look at the grooves pressed into the They Call It Justice 7” by The 45 Adapters. 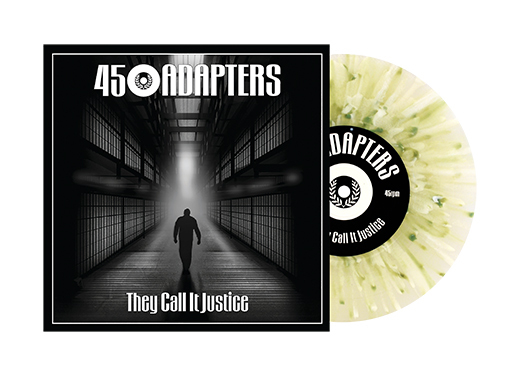 It might sound a little strange at first, but the 45 Adapters and their new 7”, “They Call It Justice,” are coming at the perfect moment in history for the band’s brand of Oi to really get over with audiences. Why? First, a pretty significant portion of the world’s population is good and pissed off with the political climate in the United States (for good, obvious reasons) and this New York band (some would say real New Yorkers – Mets fans) definitely speak to that. Could it have been done better? Sure it could – but Roger Miret and all of the bands he sings for (Agnostic Front, The Disasters, The Alligators) have been pretty quiet for the last few years and The Adapters fit the bill to fill that void. Such a summary reads a little tersely, right? It’s intended to – because that tone mirrors what listeners will hear on the They Call It Justice 7” perfectly. As soon as “They Call It Justice” crashes in, the A-side of this single lays out everything listeners who were previously unfamiliar with the band need to know about them in a succinct, two-and-a-half-minute package. With incredibly heavy hands, guitarist Dave Knight, bassist Craig Bolton and drummer Christopher Blanco all bang out an “all-for-one” rhythm figure (read: all the instrumental parts are syncopated at first) which instantly snaps listeners to attention, gets them focused and proves to be idea because it matches Gerrard Lindsay’s pushy, kind of punchy vocal delivery. That beginning may see them off, but breaking the surface tension of the song reveals that, while he may sound a little punchy, Lindsay is certainly no fool. In fact, stanzas like, “Whatever happened to Habeas Corpus/ Whatever happened to your day in court” pretty much set up the duality between content and delivery perfectly here. That persona combined with the sound of the music which supports it is an instantly engaging pair which will have listeners debating what they want to do first: throw a fist in the air or flip the 45 to keep its momentum moving. When they do get to flipping the proverbial disc over though, “Cheap” – the first of two tracks on the B-side of the “They Call It Justice” 7” – might give listeners pause and give them cause to think twice. Something about the vibe of the song just feels wrong; while the guitars keep the incendiary energy up, Lindsay’s vocal and lyrics ring as just a little too Trump-y for comfort. Lines like, “Fillin’ up the landfills, emptying our bank account” and the recurring, dismissive judgement of “Cheap! It’s cheap!”echo no small number of recent presidential complaints which have already been made in 2017. Is that actually the band’s desire? Likely not, but that doesn’t stop “Cheap” from feeling like the move which threatens to turn listeners off. At the same time, while they’re reeling from that “You’re Dying” pushed the Trump vibes just a little further forward (with talk of massive expenses and big, dangerous ideas) and promises to give more than a few listeners the chills. That is not to say “You’re Dying” actually supports the most divisive President in American history – quite the opposite – but it takes quite a few listens to really get a handle on the song’s lyric sheet and, by then, the damage will have been done and getting listeners back to listen even twice might be too tall an order to reach. The They Call It Justice 7” is out now. Buy it here on Amazon.